This Maasai Mountain of God stands prominently in the south of the landscape surrounding Lake Natron. It is an imposing, active volcano that last erupted in 2008, although lava flowed as recently as 2013. 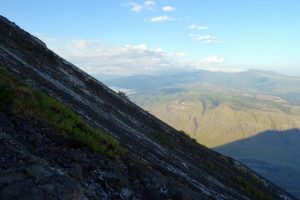 There is no massive lava lake in its crater (like the one of Nyiragongo in the DRC), but you can hike to the top and look down into its two craters, one of which is showing a lot of signs of activity. There are small lava vents, a huge smoking ash cone, small bubbling lava pits, smelly plumes of smoke coming out many vents and in many places you can feel the heat of the earth when touching the rock. 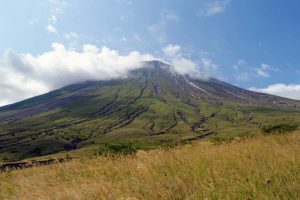 It is expected to erupt again soon, possibly even within a year, as activity has increased, but hikers are still allowed to go to the top (for now?). We had always been intrigued by this perfectly shaped, stand-alone cone when spotted from the air, and of course keen to hike to the top. The few people we knew who have climbed it all say don’t go, it’s a horribly steep climb and not worth it. But of course we wanted to check it out regardless. 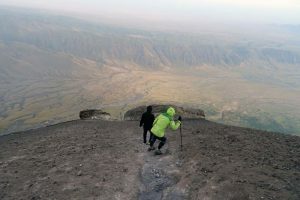 From Dar es Salaam it is quite a hike to get to Lake Natron and its sentinel Ol Doinyo Lengai. So when we had decided to ride our mountain bikes from Kilimanjaro to Ngorongoro with the K2N event, we thought it created the perfect opportunity to tag it on the end of our ride. 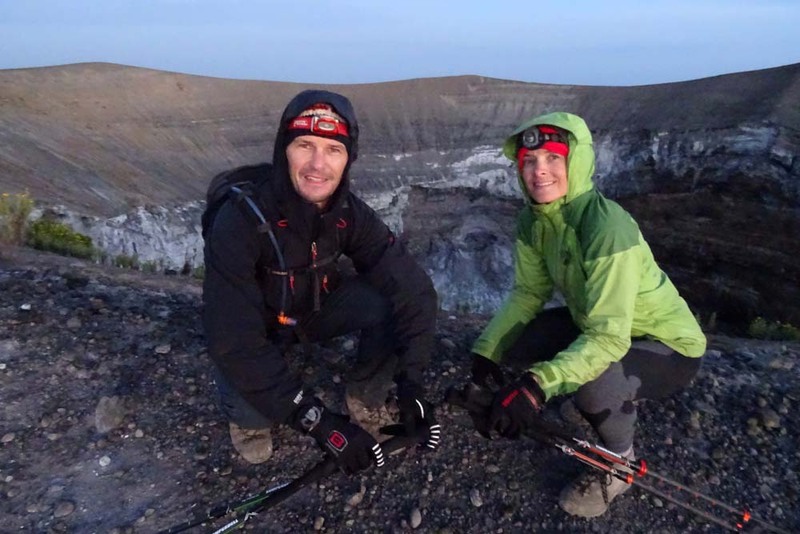 Of course that meant we would finish a 5-stage, 4-day mountainbike ride and then, without sleep, we would have to start the arduous hike and hope we would be fit enough to get back on time to make it to Kilimanjaro airport, between 5 and 7 hours drive from there. Nothing wrong with maximising holiday time! 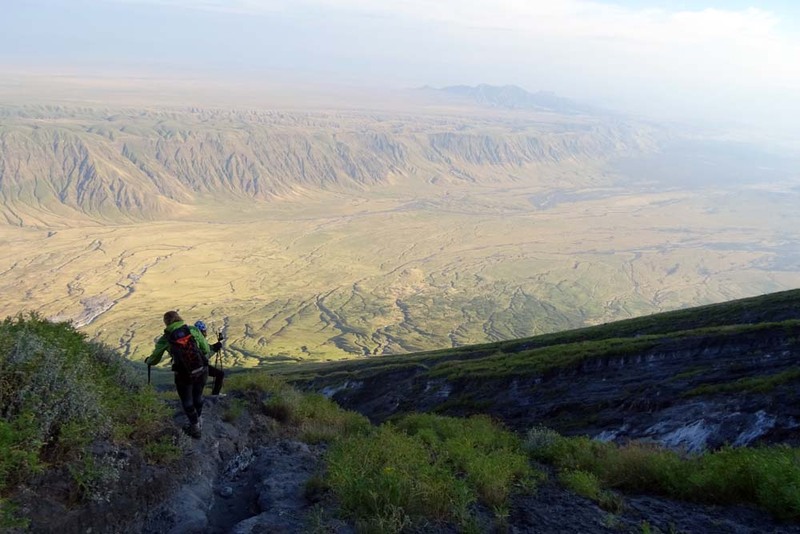 We finished the last stage of the K2N around lunch time and went back to our beautiful campsite wedged between Lake Natron and Ol Doinyo Lengai. We couldn’t see the volcano from our campsite because of all the trees that grow there, thanks to numerous springs in the Crater Highlands, but we knew it was there. After lunch we drove to the office to pay for our hiking permit and to meet our guide Matthius, a surprisingly short Maasai with excellent English and a good knowledge of the mountain. We agreed he would meet us at the campsite just before midnight. He went off to sleep, and we went off to sort out our riding gear and pack our bags for the hike. We also had to load our bikes and all our gear into the car as we would not have time after the hike to come back to the campground and do it then. It was a busy afternoon, followed by a farewell dinner, complete with prize giving and Maasai dancers. One by one our new friends said goodbye and went to bed, we had one hour left before Matthius would meet us so we went to lay down too. 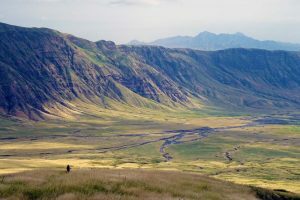 It was too short to sleep, and all too soon it was time to get up and hop in the car for the hour drive to the parking, a patch of dirt alongside a rough, sandy track, at the bottom of our destination, Ol Doinyo Lengai. A few times it looked like we weren’t going to make it as the heavy car got stuck in the deep sand, but luckily Hamza was a good driver and managed to get through. Around 00.45 we started our walk through super tall elephant grass, often as tall as us or taller. The rainy season certainly had been long and good here. It was easy walking and we made good progress. 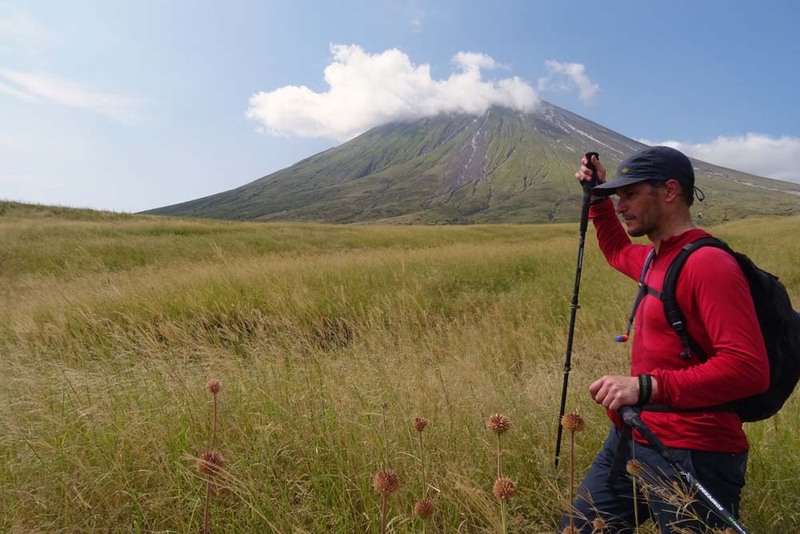 We had told Matthius we didn’t want to have rest breaks, so we plodded on relentlessly, only stopping occasionally to check out a frog or to add more layers as it got colder. 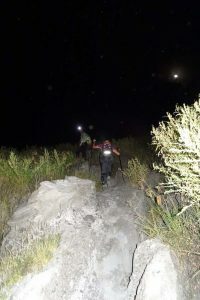 We continued to make good progress to the top however, and even had time for a little break before ascending the last 30m or so when the sky became lighter from the fast approaching sun. The day broke as we reached the top and it had certainly been worth the effort. The two craters are totally different and very interesting, but the view of the sky and the surrounding wild landscape was the best reward. 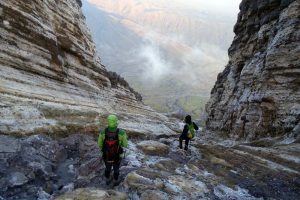 There was a slight feeling of urgency though as it was now approaching 6.30am and we knew we would be very slow on the descent. So with one last 360 degrees look around us we started our way down and quickly acquired some ‘disco-legs’ (when your muscles get the shakes from an intense workout, usually in an uncomfortable position, we call that ‘disco-legs’). The descent lasted forever and the bottom of the volcano never seemed to get any closer and we started to look at our watch anxiously. We needed to get our skates on and get to the car to ensure we had enough time to drive to the airport. 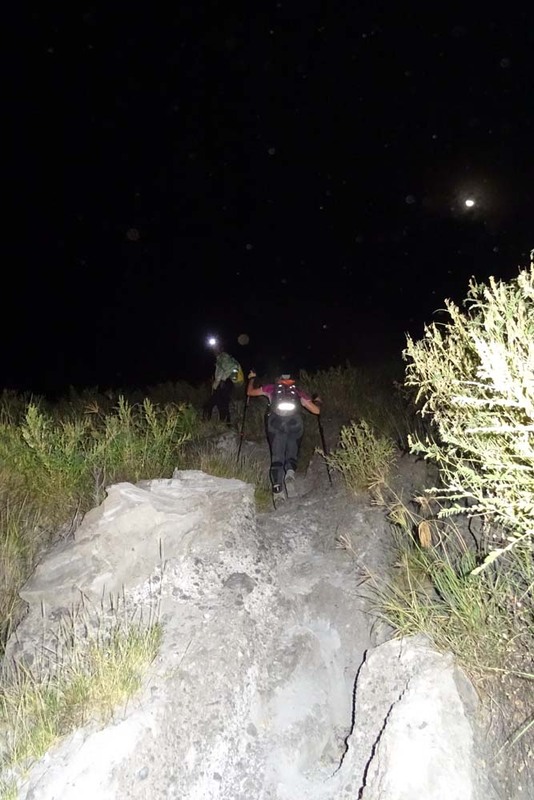 As soon as the incline and surface allowed, we jogged sections, so in the end we took 4 hours getting down. A quick breakfast was shoved in whilst getting changed, and then we were on the road. Jon with Ol Doinyo Lengai in the background, we made it! The first hours were on bumpy dirt roads, with the occasional wildlife viewing until we reached Longido. From there it is a good tarmac road all the way to the airport. It should have been smooth sailing once we reached Longido, but Jon had been sending Frank (our driver) some messages to ensure he would be at the airport at the right time, but hadn’t received any response. Both his phones appeared to be turned off. After several hours of trying we received a message from Frank from a different phone. Jon called and finally spoke to him. He was ok, hadn’t been in an accident, but had been arrested by the Arusha police. A thief was supposed to be somewhere near the bus station and the police had indiscriminately arrested more than 100 people in that area, including Frank, taken their phones off them and locked them up to start the interrogations. It is hard to believe and hard to imagine how these things can happen, but in these situations Tanzania appears to be very much a police state, and, we have been told, Arusha in particular. We immediately called the Operating Room again to let them know and to see if there was anything we can do, but it was a waiting game. Frank had told Jon he was sure he would be released the next day and would still be able to drive the car to Dar again, so instead of meeting Frank at the airport and loading up the car there,we decided to quickly race to the lodge where the car was parked and dump our bikes and luggage. In 20 minutes we finished and were on our way back to the airport again as unfortunately we had had to drive straight past the airport to get to the lodge. We arrived at the airport just in time for our flight and made it home a few minutes before midnight. It had been an exhausting, but very rewarding trip. We dumped our bags, jumped into the shower, and went straight to sleep. Another fun adventure finished. 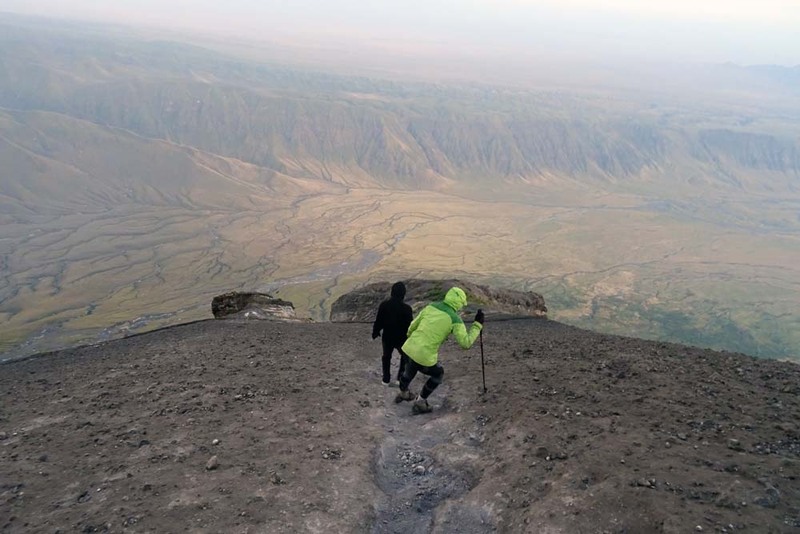 Ol Doinyo Lengai is an active volcano, 2,952m above sea level and does get quite chilly at the top early in the morning. It is a unique volcano because its lava is not rich in silicate minerals, but it’s carbonatite. 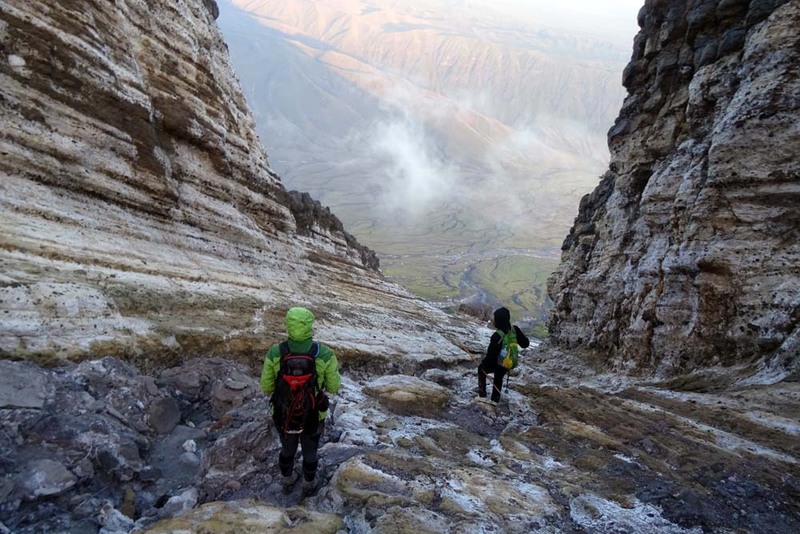 It is the only active carbonatite volcano in the world. This means that the landscape around the volcano is totally different from other volcanoes. Ol Doinyo Lengai’s lava erupts at the low temperature of around 500 degrees Celcius. This is why the molten lava appears black in sunlight. It’s also much more fluid than other lava, often thinner than water. Once the lava is deposited, the sodium and potassium in it are very unstable and weather rapidly. The lava turns grey quickly and we saw the massive gullies cut into the lava by the rain runoff. The office of the conservancy is located to the north of Ol Doinyo Lengai. 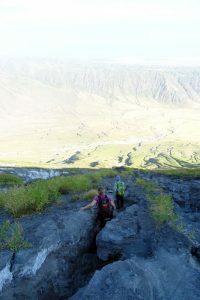 Climbing fee is $100 per person, $140 for 2 people and $180 for three, this includes a guide. 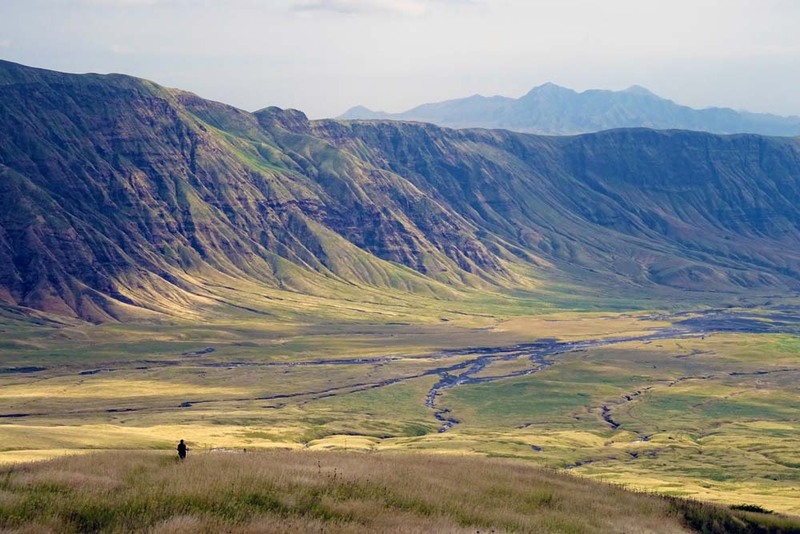 You can also pay the fee here for a game drive in the area, to visit the waterfalls, check out the dinosaur footprints left in the lava of an ancient eruption, and see if you can find the flamingos in the north of Lake Natron. This permit costs $20 per person and includes all of the above activities. We’d love to try to get back to do this… let us know if you want to join! Wow, you definitely jam-packed this trip! But you forgot to mention if Frank was released on the next day and could drive home. oh oops, yes he was released and managed to drive home the next day! You two are definitely adventurous.